BASSETERRE, St Kitts (WINN) — Controversial Jamaican dancehall artiste Alkaline performed to a packed house at Carnival Village in Basseterre, St Kitts, in the early hours of Sunday morning, according to reports. Alkaline was originally booked to perform in Nevis but permission was withdrawn by the Nevis Island Administration. That move prompted authorities on St Kitts to grant permission to the artiste to perform in Basseterre. WINN understands the concert got going at close to 11:00 pm with a number of local acts. 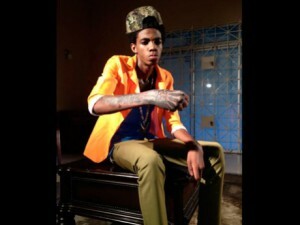 Alkaline, aged 20, who was the first dancehall artiste to tattoo his eyeballs, reportedly took to the stage at close to 3:00 am to perform the clean versions songs known for their lewd lyrics. There were no reported incidents at the show. Alkaline has been accused by some of being a devil worshipper and his recently published photo posing in front of a grave at Basseterre’s Springfield Cemetery is interpreted by some as proof that he is. Others however, say the photo is just another example of a publicity stunt by an artiste craving attention. Earlier, media reports surfaced that there was a difference of opinion in the Nevis Island Administration about allowing Alkaline on the island. WINN FM raised that issue with Deputy Premier Mark Brantley, who is also the leader of the federal opposition. “The Alkaline concert had absolutely nothing to do with the government. The government was not asked to approve anything, and I categorically reject any suggestion that I, as a minister, approved any concert,” he said over the weekend. “The concert as I understood it was a private concert, being put on by private entrepreneurs, which is their right, and I gather that they applied for and obtained the necessary police permissions,” Brantley said. “Certain representations were made to the Cabinet of the Nevis Island Administration, and the Nevis Island Administration through its Cabinet took a decision that the artiste would not be allowed to perform in Nevis because of the lewd, violent and frankly crude lyrics that his songs contain. I believe that in light of the current social difficulties that we’re experiencing, in light of the crime and violence that we’re seeing, that the Cabinet took the considered view that this was not the type of event that we would want our young people exposed to,” he explained. Brantley acknowledged that the NIA decision drew heavy criticism in social media and on radio. “It’s a Cabinet decision. We take collective responsibility. I have subsequently ascertained that the prime minister has embraced [a concert] for St Kitts, but that’s a matter for the prime minister. He ought to know why, and he ought to be able to determine what he wants to see happen in the four corners of St Kitts, but in the four corners of Nevis, that becomes the responsibility of the Nevis Island Administration,” the deputy premier said. “Whilst I recognize that the decision was controversial, the reality is… that leadership is not always easy, and leadership sometimes requires people to take hard decisions, principled decisions even though they’re not popular, and that is what was done in this case, and I trust that in the fullness of time, and with the benefit of hindsight, the wisdom in that will become apparent to all Nevisians and indeed all Kittitians as well,” Brantley said.